Imagine being able to create and share your own music from the same pool of audio clips as professional performers ahead of a live concert and helping to construct their final work from your smart phone by communicating directly with the musicians involved. Luke Daniels the award winning folk singer and musician hosts a new folk and world music quartet that makes use of such mobile technology to create new music with their audiences in the run up to each performance. 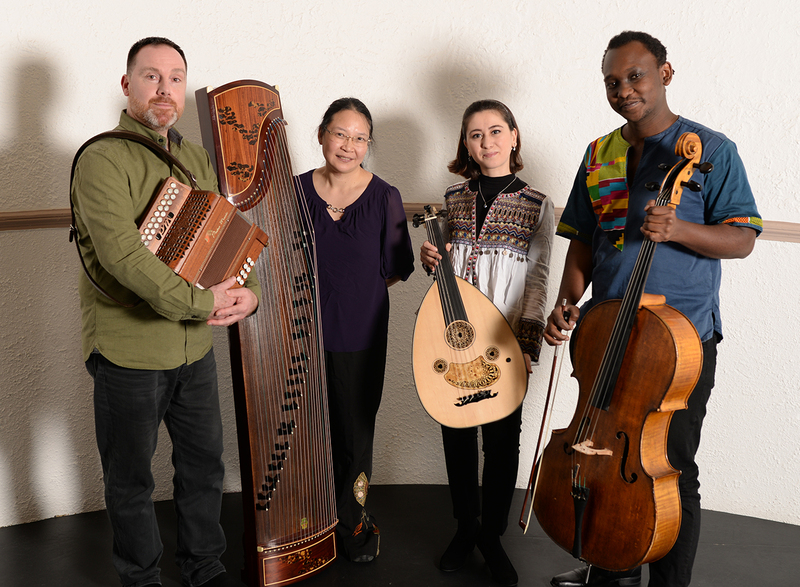 Joined by three international soloists from Syria, China and South Africa as the Kaleidoscope quartet. Audiences will be able to create and share their own musical arrangements from a pool of prerecorded audio clips of each artist involved by downloading the MusicMeme mobile app to contribute towards the development of their final work. Rihab Azar is from the Syrian city of Homs. She studied at the Conservatoire of Damascus under such masters as Askar Ali Akbar and Issam Rafea. In 2014, She became the first woman oudist toperform accompanied by the Syrian NationalOrchestra for Arabic Music. Since moving to the UK in 2016 under the “Migrant Talent” schemeshe has performed with the London Sinfonietta and at St. Paul’s Cathedral. Abel Selaocoe is a South African cellist who collaborates with beatboxers and world musicians whilst giving solo classical recitals and concerto performances as a soloist with numerous orchestras including Kwa-Zulu Philharmonic, Johnannesburg Phil and Randburg Symphony. He has performed at the Aldeburgh Festival and at theBBC Proms. Tickets are £14/12 for each event but venues are offering a £25% discount for bookings for all four shows in the series with a view to getting in volved with the creation of our new work or simply watching it developing via the different musicians involved.